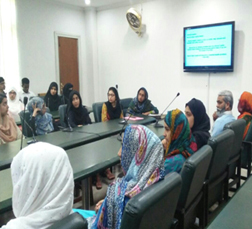 LAHORE: (Monday, April 16, 2018): Department of Microbiology and Molecular genetics organized 'Student Counseling Seminar'. The seminar focused to provide students with proper guidance and counseling to help them combat emotional and psychological problems, and also ways to develop problem solving skills. Hina Khan, compere of the seminar said, "MMG has since organized various conferences, workshops and seminars to help students seek knowledge relating to their academic career. Alongside the department also focuses on arranging sufficient co-curricular activities for students to instill into them 'Art of living and working together.'" 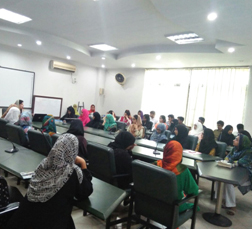 Ms. Sadia Shahzeb providing her services as a student counselor at student's 'Counseling and Assessment Services Centre, Health Centre, University of Punjab'; was invited for the lecture. She said, "Depression is a major disease nowadays. Two things are important for a stress free life i.e. 'Wellbeing' and 'Resilience'". 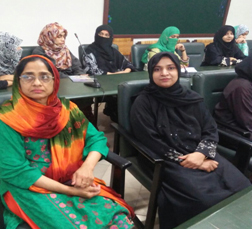 She advised the students saying, "Self acknowledgement is necessary that develops confidence. Students should indulge themselves in healthy activities and learning new skills alongside following a proper schedule for study. Also time management is key to be successful." 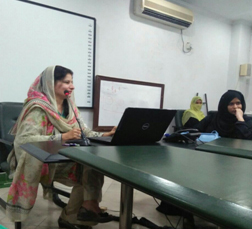 In last organizing committee members, in particular, Dr.Zakia Latif and Dr.Samreen Riaz were congratulated for organizing a successful event for the students.